The next installment of the history of planning in Wales is by Neil Harris who discusses the post-1947 period up to the start of devolution of planning to Wales. This article was, written for, and first published in the Royal Town Planning Institute Cymru’s newsletter Cynllunio in Summer 2014. The title for this article is taken from the famous quote by American architect and planner Daniel Burnham. The quote captures planners’ ambitions during the post-war period in Wales. Planners and government dared to ‘make big plans’ during this golden era in planning history. As Sir Patrick Abercrombie remarked, “A decade in a swiftly evolving subject such as the science and art of Town and Country Planning is a long time”. So, capturing the five decades of planning in Wales following the Second World War is particularly challenging. This short history is a selective one, focusing on key events between the end of the Second World War in 1945 and the period immediately prior to the devolution referendum in 1997. The challenges for planning in post-war Wales were varied. They ranged from reconstruction of urban centres, and providing housing to accommodate workers in the newly industrialised areas, to stemming rapid population decline in rural mid-Wales. Swansea was the most badly damaged of Wales’ settlements during the War, yet within a few years the Government reported considerable progress in the reconstruction of “the war-destroyed centre of Swansea”. Planners’ skills in reconstructing Wales’ bomb-damaged towns were augmented with new skills in building new, planned communities. Cwmbran in South Wales is an example of a ‘Mark I New Town’, being the first generation of New Towns under the New Towns Act 1946. The principal reason for establishing Cwmbran was to provide housing for workers in the various industries in this area, and to reduce commuting across the region from existing settlements. The Cwmbran Development Corporation aimed “to set a standard of what a modern Industrial Town should be” and “to create a happy, friendly and pleasing town”. Special features of the town centre included “a system of permanent canopies attached to the shops, the segregation of pedestrians from vehicles and ample car parking”. 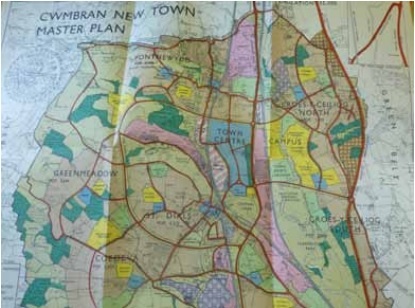 Cwmbran was among the first settlements in Wales to be designed through a master plan, which was novel at the time, and generated a great deal of comment on the distinction between setting out a strategy and deferring consideration of details. The Cwmbran Development Corporation was keen to ensure Cwmbran was “not just a town of the planners”, and argued that “building a new town is in its essence a most human problem”. 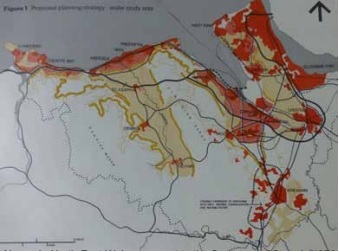 Above: Cwmbran Development Corporation’s pamphlet emphasised Cwmbran’s strategic location. Note the reference to ‘A’ roads prior to construction of Britain’s motorway network and the Severn Bridge. The Master Plan for Cwmbran was based on the neighbourhood unit, with each neighbourhood related to the planned town centre. Cwmbran Development Corporation explained that a town of 35,000 population was “too big to be considered as a single unit” and that it “would involve too much travelling for the housewife to reach the shops”. The neighbourhood units provide for shops, schools, housing and public space, with detailed estimates of population. Planning for developments in the post-War economy were also significant, with trading estates developed at Hirwaun, Treforest and Bridgend. In other parts of Wales, the clearance of derelict sites was a priority in the immediate post-War period, with generous grant funding to bring sites into recreational use. And, across Wales there was a significant concern for “depopulation of the Welsh countryside and impoverishment of the life of rural Wales”. These concerns led to the designation of Newtown in the Upper Severn Valley, following the appointment of the Mid-Wales Development Corporation in 1968. Some feared that “unless there was government intervention, Mid-Wales would become almost entirely depopulated”. provisions of the Act took place. The shortage of skilled staff in Wales “had retarded the preparation of the survey and development plans” that were required by the new system. Yet, with the Government’s support, it was “hoped that planning authorities will be able to complete their development plans within the three years laid down by the Act”. Merioneth managed to produce Wales’ first County Development Plan in 1951, while Glamorgan finally adopted its plan in 1968. Several industries were also nationalised in the immediate post-war period, including the railways and the coal industry, which was of particular importance in the Welsh economy. The classic Welsh example of making ‘big plans’ is the South Wales Outline Plan published in 1949 and written by T. Alwyn Lloyd and Herbert Jackson. A Government report of the time notes how in South Wales “it might seem the logical policy, at first sight, to abandon many of the mining towns in any future plan and think in terms of transferring the population to places where better conditions could be provided”. Yet the Outline Plan concluded differently, and instead aimed to increase the attractiveness and convenience of existing Valleys settlements. The plan and its critique highlight the grand visioning characteristic of the time, given the preparedness to entertain the abandonment of the existing settlement pattern. The Government in 1951 also noted how “In Wales, it is particularly hard to reconcile modern development with the country’s extraordinary natural beauty”, a challenge thrown into sharp relief by proposals for hydro-electric schemes in north Wales. Various designations recognised this natural beauty, including the designation of Snowdonia (1951), Pembrokeshire Coast (1952) and Brecon Beacons (1957) National Parks. Britain’s first Area of Outstanding Natural Beauty in the Gower followed quickly thereafter (1956), with further AONBs designated later in places including Ynys Mon and the Wye Valley. 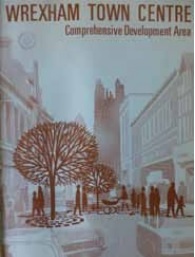 Planners in the late 1960s were faced with a changed development plans system, based on a system of Structure Plans and Local Plans, which was premised on distinguishing the strategic aspects of planning from the tactical ones. The opportunities and problems facing different parts of Wales in the late 1960s were captured in ‘Wales: The Way Ahead’. In North Wales, the growing tourist economy was replacing employment opportunities in other, declining sectors, and there was a need to manage the decline of the substantial, but temporary employment opportunities created by major engineering projects at, for example, Trawsfynydd and Wylfa. For West Wales, some parts of the area had been transformed by “the remarkable post-war development of the oil refining industry”. The period was one characterised by significant social and economic change. The 1960s and 1970s also witnessed the development of a distinctive institutional landscape for planning in Wales, with various organisations dedicated to planning and economic development. The establishment of the Welsh Office in 1965, shortly after creation of the Secretary of State for Wales post the preceding year, started to provide a particular, Welsh character to planning guidance by significant social and economic change. The 1960s and 1970s also witnessed the development of a distinctive institutional landscape for planning in Wales, with various organisations dedicated to planning and economic development. The establishment of the Welsh Office in 1965, shortly after creation of the Secretary of State for Wales post the preceding year, started to provide a particular, Welsh character to planning guidance. As for practices of this period, Colin Buchanan and Partners’ scheme for Cardiff (1968) provides a good example of techniques, styles and methods of planning of the era. The report embraced modernisation of the city and declared that “much of the city is either obsolete already or likely to be so before the end of the century”. And, as if to deliberately underline the value of foresight, Buchanan’s report noted that “the population [of Cardiff] seems certain to increase by the end of the century to an extent which cannot possibly be dealt with within the present. Above: Buchanan’s plan for Cardiff was focused on modernisation of the city, including the provision of roads to accommodate increasing use of private motor cars. 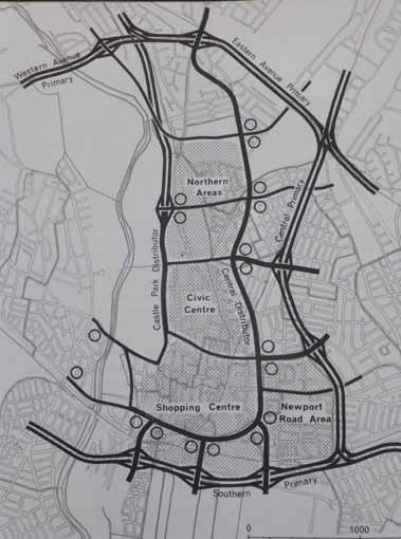 The controversial plan included a central and southern primary route cutting through parts of inner urban Cardiff. As for practices of this period, Colin Buchanan and Partners’ scheme for Cardiff (1968) provides a good example of techniques, styles and methods of planning of the era. The report embraced modernisation of the city and declared that “much of the city is either obsolete already or likely to be so before the end of the century”. And, as if to deliberately underline the value of foresight, Buchanan’s report noted that “the population [of Cardiff] seems certain to increase by the end of the century to an extent which cannot possibly be dealt with within the present city boundary”. This fervour for clearance and modernisation dramatically changed the townscape of many Welsh settlements. Market towns, such as Abergavenny, lost many significant buildings of historical and architectural interest through a quest for modernisation and to accommodate increasing road traffic. Wrexham too had plans made for comprehensive redevelopment of its town centre. Valleys. This period was also one during which the interface between housing and the Welsh language was recognised. The lobbying of Government on this issue by north Wales planning authorities prompted the publication of guidance on the Welsh language as a material consideration. Other distinctive aspects of housing in Wales were also recognised, and included the need for executive housing in the open countryside. Changes were made to planning policy in Wales to address what some identified as an ‘Anglo-centric’ character to planning policy issued at Westminster, with the introduction of the Planning Guidance (Wales) series, an important frontrunner to Planning Policy Wales. The discourse of ‘sustainable development’ also emerged from the late 1980s, and later became embedded in the principles of the planning system in Wales. Above: In North-East Wales, a report to the Secretary of State in 1970 explored the need for a positive policy for industrial and commercial development to prevent the tendency for East Flintshire “to become more and more an outer suburb of the conurbation centred on Liverpool”. The same document also explored the concept of ‘Welshness’, and included historical ‘linguistic divides’ in its analysis. The key theme that emerges from exploring the immediate post-War period of planning in Wales is the ambition to prepare ‘big plans’. It is a period marked by significant destruction and reconstruction of town and city centres, and major changes in the spatial economy driven by developments in what we now easily overlook as everyday infrastructure, such as motorways, strategic bridges and energy schemes. It is a period when new settlements were designated and implemented, and when genuinely strategic and sometimes radical ideas informed planning practice. None of those ‘big plans’ were easy to make; many were controversial, while others were radically altered, or even opposed, in their implementation. That optimism and ambition fades through the 1970s, with various plans abandoned and others scaled back. The art of plan-making and implementation, and the skills of strategic planning, can perhaps be revived…and maybe Wales’ planners can make ‘big plans’ once more. Neil Harris is a Senior Lecturer in the School of Planning and Geography at Cardiff University, HarrisNR@cardiff.ac.uk. Neil is part of a small team working on this Centenary History project and we are also developing a resource on the RTPI website. If you would like to contribute, please e-mail: roisin.willmott@rtpi.org.uk. All of the articles compiled as part of the History of Planning in Wales project have been assembled on the RTPI Cymru webpages, along with other information related to the project, including a bibliography of materials.